Saskatoon’s business tenants will soon have an opportunity to shift from aging office stock into an inventory flush with new high-end work spaces, as several new projects get underway in the mining office hub. “We haven’t seen major new office buildings built for quite some time,” said Tom McClocklin, the president and managing director of Colliers International Saskatchewan in Saskatoon. “There is potentially quite a supply of office coming to the Saskatoon market,” he told RENX in a recent interview. Construction is underway on the 12-storey East Tower at the River Landing mixed-use complex in the south downtown area, according to a summary of new office space by the firm. Leasing is well underway for the 155,000-square-foot facility, and a second, taller office tower is also under consideration for the site. Meanwhile, the World Trade Center, led by Canwest Commercial and Land Corporation, has delayed development, but that 65,000-square-foot project could commence later this year, according to Colliers’ 2017 fourth-quarter report. The redevelopment of the former Saskatoon police building at 140 4th Avenue North has also started. Renamed the River Quarry on 4th, the 64,000-square-foot project by Duchuk Holdings could be ready for occupancy as early as September 2018. 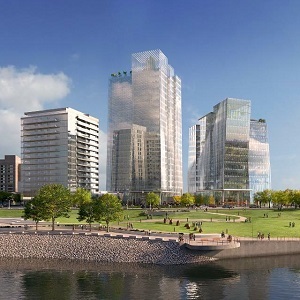 Those three projects would add 284,000 square feet to the city’s office sector. McClocklin said Colliers has the downtown class-A vacancy rate marked at six per cent, while the overall office vacancy rate could be closer to 15 per cent. He said the developers believe tenants will want to relocate their businesses to new, state-of-the-art space with improved sustainability and better amenities. Saskatoon remains a market dominated by mining and agricultural firms, McClocklin said. The city, with a metro population of just under 300,000, hosts the head offices of Nutrien (formerly Potash Corp. and Agrium); Cameco, one of the world’s largest uranium producers; and Saskatoon Co-op, the grocery, petro and hardware retail co-op chain. “When you look at mining, you have engineering firms that are a spinoff from that,” McClocklin said. He said the tech industry is also starting to emerge, and the city has the usual mix of professional services such as accounting, finance and legal firms. So far, asking lease rates remain relatively stable according to ICR Commercial Real Estate‘s 2018 first-quarter report. It pegs the competitive downtown market at $20.25 per sq. ft.
Barry Stuart, ICR Commercial’s managing partner, said the firm’s Q1 report shows an office vacancy that is creeping up and will likely edge higher when the new inventory comes on stream. “Right now, at the end of the first quarter of 2018, the competitive downtown (vacancy) rates are 17.6 per cent and the class-A (vacancy rate]) is really very close to that,” said Stuart, whose team is marketing the River Quarry on 4th project. The class-B and -C vacancy rates are “north of 20 per cent”, he said. Stuart said opinions are split over whether this is a good time for new office space. He said it could take two or three years for the new space to be absorbed. While commodity prices remain low, there likely isn’t much commercial growth in store for Saskatoon, Stuart said. McClocklin agreed. The market will have to wait to see what happens when prices for potash, oil and uranium rebound, he said. “We really need to see those industries have a bit of a turnaround in their commodity prices,” he said. In the meantime, the new office stock will be welcomed by tenants eager for new space at competitive rates, he said.